Fancy yourself as an inventor? The London Orchard Project is looking for someone to design and make a new pedal-powered apple crusher for easy juicing of urban apples. This is an exciting opportunity to create a really useful product that does not currently exist. The crusher will be used by us and community groups across London harvesting and juicing local fruit. It’s a great opportunity to be part of the future of local fruit production and processing in our wonderful city. Apple juicing is a 2-stage process. First the apples need to be crushed to a pulp, then they are pressed to get the juice. Small scale community apple juice producers using hand-operated crushers know through bitter experience that the crushing stage is slow, dull and blister-inducing. There are electric crushers available, but these are too expensive for small voluntary groups, require a power source (not always available at outdoor events) and conflict with the low carbon/ off the grid ethos of small-scale community food production. They are looking for an intermediate technology apple crusher: faster and easier to use than existing hand-operated crushers, but without need for electricity. Ideally (but not necessarily), you’d be up for sharing the design with other groups who may want to make their own. They have a £200 prize for the person who makes us the crusher. And you’ll get the satisfaction of knowing your creation is being put to good use and enjoyed by 1000s of Londoners. And they will make sure to spread the word about the brains behind the crusher. Closing dates for entries is 20th July. The winner will be announced on 25th July. Join us on Wednesday night for the West Ealing Neighbours Meetup and Tweetup! On Wednesday night we’re holding the first West Ealing Neighbours Meetup and Tweetup at the Star and Anchor pub in West Ealing, from 8pm. It’s going to be a great evening, and a good chance to meet your neighbours and have a chat about our area. You can RSVP here, otherwise just come along on the night. We’ll be at the front of the pub – there will be a big blue Twitter sign, so you’ll know where to go! West Ealing Pickers – you know who you are! (And, if you aren’t in the know, would you like to know more? See below). Blackberries are next on the picking calendar – could be as early as mid-July (but we’re checking out the picking fields shortly). Come to the Star and Anchor, Uxbridge Rd on Weds eve for social eve. Vice Chair of West Ealing Neighbours, Eric Leach, updates the recent progress in the construction of Dickens Yard in Central Ealing. Just to jog your memories, Dickens Yard is the land between Ealing Town Hall and the railway stretching from Longfield Avenue to almost Haven Green. In October 2009 developers St George finally overcame all hurdles to ‘buy’ this land (250 year Lease). What local and regional government agreed to was 698 flats to be built; rising in seven tower blocks to 15 storeys; with 20 small/medium sized shops at ground level. 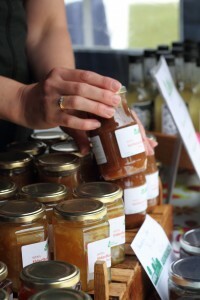 For those of you that missed us at Hanwell Carnival we will be at PPiTP for the first time selling our lovely locally picked and made produce – including our best selling elderflower cordial (£2.50) We will also have our chutneys this time – we had lots of requests at Hanwell for these! 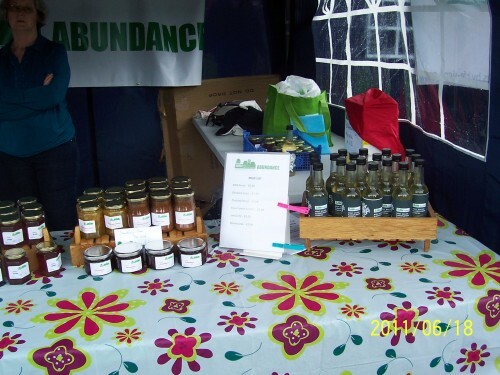 You can also find out more on the Abundance project and volunteer too! 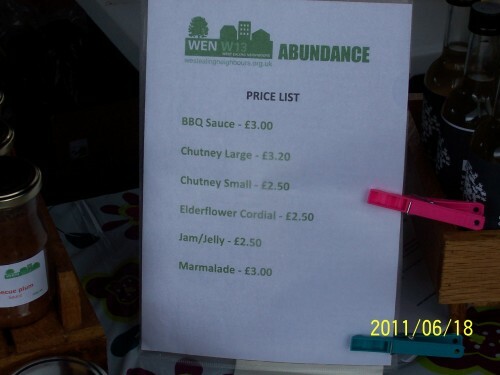 When I took a break from being on the WEN Abundance stall at the Hanwell Carnival on Saturday I wandered over to visit the W7 Emporium stall. W7 Emporium has been set up by Hanwell resident Claire Rosser and is a brilliantly simple idea. She offers a monthly cheese subscrption service whereby for £24 a month she will deliver a carefully sourced and selected range of British and international cheeses. 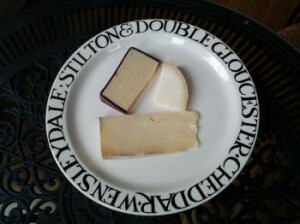 For your £24 you get 1kg of cheeses, often award-winning, which you’re not likely to find in your local supermarket. I bought five cheeses from her at the Carnival and we had a tasting last night, and they were all good. Some deliciously strong cheddars, a tangy ewes milk cheese and a very creamy Shropshire Blue amongst them. She will deliver to the W7, W13 and W5 areas on the last Friday of each month. I’m about to fill out my subscription form and you can find out more details by emailing w7emporium@gmail.com or call Claire on 07828 971200. I’ll update this post after we get our first delivery. Hi, we’re there – and so are hundreds of other people. It’s a great event- try to drop round and see us. 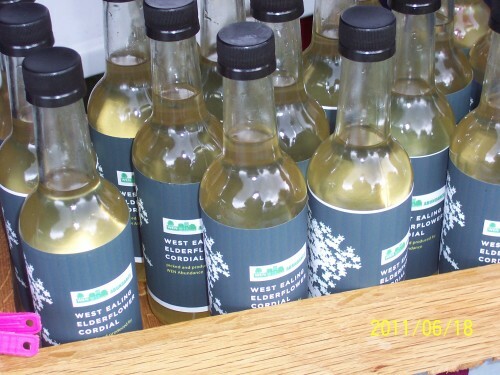 (I recommend elderflower and lemon marmalade on creme fraiche on bread – lovely stuff). A parking problem in West Ealing. What’s the answer? Not for the first time West Ealing Neighbours has heard about parking problems of residents in the Lido House (corner of Northfield Ave and Mattock Lane). The Lido is one of a number of new local buildings that are designated low car housing with little or no car parking space. Sinclair House and Luminoscity are just two of the others. This is part of a deliberate plan to reduce car usage in London. Until fairly recently if residents of Lido House owned a car they could park it in some of the nearby streets without parking restrictions. However, this came to an end when the new CPZ was introduced around St John’s Church and nearby streets. When car-owning residents applied for a parking permit for the new CPZ they were told that restrictions were in place and that residents in designated low car housing are ineligible for either resident or visitor permits. The key question is did residents know this before they moved in? If not , would it have affected their decision to move there. On top of that when new residents now move in or buy a flat there are they made aware of the parking permit restrictions? If not, whose responsibility is it to make these parking restrictions clear? Is it the estate agent, the seller or the building’s owner A2Dominion? It’s a tricky one and I’m not sure where I stand on this. Is it fair or unfair to residents of the Lido House, and similar local blocks of flats? What do you think? At last night’s meeting (14th June) hard work and people power helped persuade the Ealing Labour group not to recommend closure of four libraries – Hanwell, Northfields, Northolt and Perivale. Petitions signed by over 8,000 residents were presented to the meeting and a packed gallery listened to the debate. At the end of the debate Cllr Dheer made his announcement which will go for approval to full cabinet on July 5th. One service that will be lost is the mobile library service and changes do lie ahead as the Council wants volunteers to play a key part in providing future library services. Congratulations to everyone who signed the petitions, the councillors who helped organise some of the petitions and who fought hard and the residents groups who worked tirelessly to save these libraries.